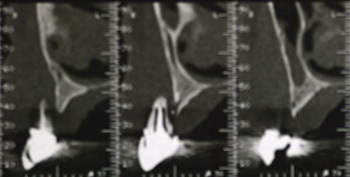 A 63 year-old woman, with no medical history and no general contraindications, consults for an overall treatment plan. 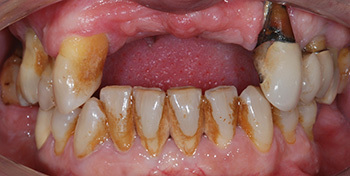 She smokes 15 cigarettes per day and has the impression of having suffered from "40 years of dental care". She has little respect for her teeth. She has never been informed of periodontal diseases and has never received any periodontal treatment nor any oral hygiene instructions. The functional and aesthetic demand is high. Topographical survey of initial pockets with generalised 8 to 15mm pockets, affected furcations on tooth 16 and 48 in the mesial plan. Migration of teeth, total loss of gingival attachment at the edentulous level, although keratinised and thick, mastication is difficult. Fig. 1: Initial clinical examination showing the removable prostheses with visible clasps, a large accumulation of tartar and root denudations. A painful experience for the patient. Fig. 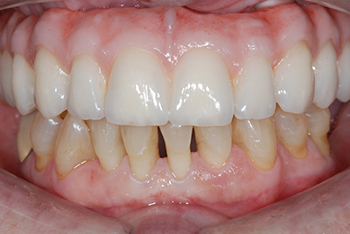 2: The anterior edentulism has resulted in a ridge and a total loss of gingival attachment. Nonetheless, the periodontal biotype remains thick. Fig. 3: Initial panoramic X-ray showing the depth of periodontal lesions, the affected furcations, the general osseous loss and deep caries in the maxillary. The cone beam X-ray examination (Fig. 4a and 4b) shows roots outside the alveolar bones, thin ridges, molars surrounded by important osteolysis, near complete destruction of vestibular and palatal tables as well as a low height of sinus floor without effraction of the inferior wall. Figs 4a and b: Cone beam X-ray shows residual dental roots outside of the alveolar bones, an important osteolysis which has led to a low height of the sinus floor and reduced bone thickness. Final screw-retained complete zirconia-ceramic prosthesis. 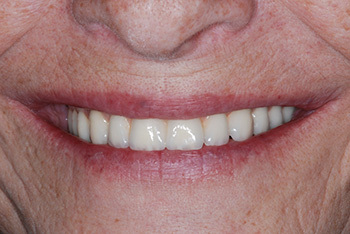 The provisional removable complete denture (Fig. 5), pre-prepared with a spaced individual impression tray, will meet all the aesthetic, functional and occlusion criteria and will be our best ally for the rest of the treatment. Therefore, it should be prepared carefully, as if it were our only treatment plan. 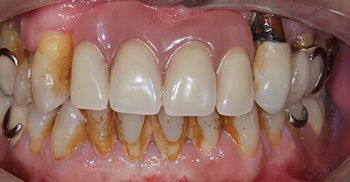 A reasonable period of periodontal maintenance (Fig. 6), healing and aesthetic and functional validation for this first step of the treatment is necessary. A precise aesthetic analysis taking into account the anatomic variations, the lip support, the residual bone position, and teeth proportions and positions is essential in order to find out the available prosthetic space which will need or not a final prosthesis with a false gingiva. Fig. 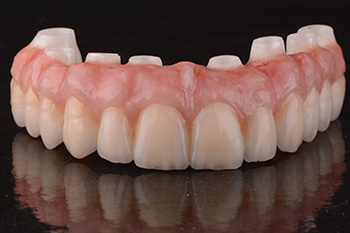 5: The provisional removable complete denture must be completely satisfying at the functional and aesthetic levels. This will be crucial for the rest of the treatment. Fig. 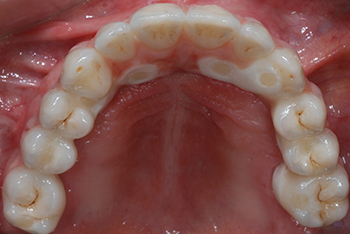 6: The initial periodontal treatment must be accompanied by rigorous maintenance as well as unfailing commitment. This is a prerequisite prior to any implant prosthetic treatment. Fig. 7: A bilateral sinus augmentation as well as an onlay graft in the anterior sectors will be performed during the same session. The use of allogeneic bone from a bank avoids considerable autogenous sampling and will allow for a simpler post-operative course. A 3D X-ray control of the bone healing is performed with a radiological and surgical guide (duplicate of the removable complete denture). 8 implants (Branemark System MK3 and Speedy Groovy, Nobel Biocare) are placed using the buried method in order to allow the patient to keep her removable prosthesis during the healing phase. Fig. 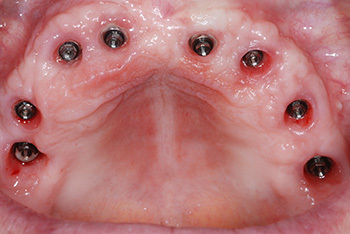 8: After a 6-month healing period, 8 implants are harmoniously placed on the arch with the buried method. Fig. 9: Functional loading after 4 months of healing. 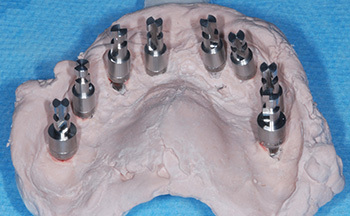 Placement of MUA RP 1mm abutments (Multi-unit Abutment®, Nobel Biocare) tightened at 35N/cm. Provisional cylinders are placed and will be used for an immediate impression. Screw-retained zirconia-ceramic final prosthesis (Figs. 10 to 12). A plaster impression is made with the copings in place. Even if done with great precision, a plaster core will be tried in order to validate this step. 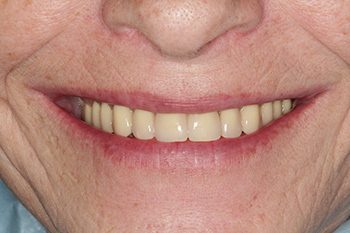 An aesthetic teeth arrangement is produced and tried in the mouth. After validation, the fabrication of the zirconia framework using CAD/CAM can begin. This method guarantees a passive fit in comparison with cast frameworks. The zirconia framework shows excellent mechanical properties and of biocompatibility. Then, the stratification of ceramics will start. A ceramic thickness of 1.5 to 2mm maximum will prevent any fracture of the ceramics. The quality of work and experience of the prosthesist are crucial to the success of this step. Sufficient time (about a month) is needed for the production of the zirconia framework and for the stratification of ceramics. Fig. 10: The shape, the emergence profile and the basal surface of the provisional bridge will enable better biological and aesthetic integration of the final rehabilitation. Fig. 11: The impression will be made using an individual impression tray and, preferably, always in plaster so that a passive framework can be produced. Fig. 12: The zirconia framework (Procera®, Nobel Biocare) and the ceramics stratification are produced. Note the presence and the quality of the buccal flange in pink ceramic to overcome any osseous resorption in the vertical direction (Prosthetist Mr. Jean-Pierre Casu, Laboratory Kosmeteeth, Nice). The denture (Fig. 13 to 15) is tried on over a long session to check the passive fit of the prosthesis as well as all the functional and aesthetic parameters determined during the transition period of the provisional bridge. If necessary, the occlusion is adjusted directly in the mouth. Fig. 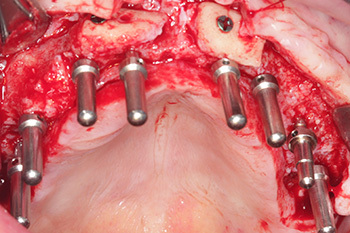 13: Try-on of the final prosthesis in the mouth and adjustments of the occlusion. Fig. 14: Occlusal clinical view showing the harmonious distribution of the implants on the maxillary arch, despite the more palatal position of the anterior implants in order to avoid the cortical part of the onlay graft. Fig. 15: Idealised smile line and excellent aesthetic integration of the final prosthesis ensuring the patient's satisfaction at the functional and aesthetic levels. The main purpose of such a prosthetic rehabilitation, which lasted 2 years, is the patient's satisfaction at functional and aesthetic levels. A preliminary pre-prosthetic project is essential and will be instrumental in the progress of the treatment plan; the prosthesis guides the surgery and not the opposite. The experience and understanding of the surgery and prosthetics team in partnership with those of the prosthetist will be key to the success of this type of treatment. Periodontal maintenance and a permanent commitment are inseparable from the longevity of the treatment; the patient must be accompanied at all stages of the treatment. 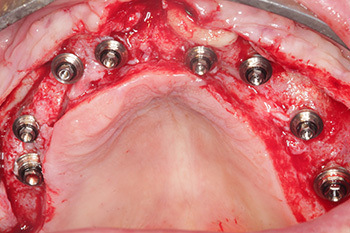 Attard N. J., Zarb G. Long-term treatment outcomes in edentulous patients with implant-fixed prostheses: the Toronto study. Int J Prosth 2004;17:417-424. Mainjot AK, Schajer GS, Vanheusden AJ, Sadoun MJ. Influence of zirconia framework thickness on residual stress profile in veneering ceramic: measurement by hole-drilling. Dent Mater 2012:28:378-84. 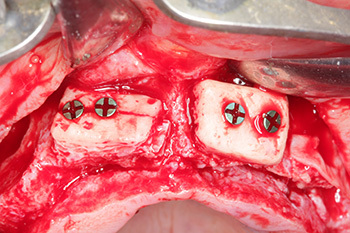 Novell J, Novell-Costa F, Ivorra C, Fariñas O, Munilla A, Martinez C. Five-year results of implants inserted into freeze-dried block allografts. Implant Dent. 2012;21:129-135.